DYNAMIC FLEET MANAGEMENT will focus on real time management of a distribution system. This means that when a dynamic event occurs within the distribution chain, action must be taken in "real-time." The book will integrate the latest results in system design, algorithm development and system implementation, to capture the state-of-the art research and application trends. While much of the research in this area of transportation problems have almost exclusively concentrated on carrying out static plans on optional distribution conditions, this book will examine those problems when some dynamic or unplanned even occurs within the transport or network system. It will focus specifically on these cases and integrate the latest results in systems, routing algorithms and case studies where information (a dynamic event) is revealed to the decision maker in a real-time manner. 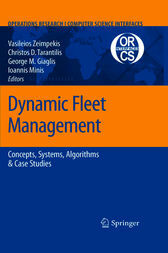 The book’s purpose is to investigate and analyze the emerging field of Dynamic Fleet Management from several perspectives. The book includes chapters that present the systemic background of important dynamic fleet management areas such as goods dispatching, couriers, rescue and repair services, taxi cab services, etc. Algorithmic approaches are outlined that are able to process real time information and produce acceptable-quality solutions in modest computing times. In addition, the book includes real-life case studies that describe the solution to actual distribution problems by combining systemic and algorithmic approaches.